An Italian marina is facing a hefty repair bill and numerous insurance claims after the wash from a brand new cruise ship destroyed one of its pontoons. 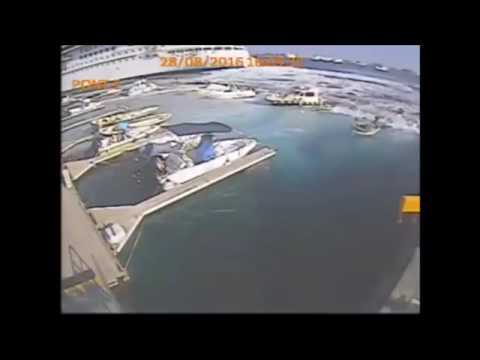 As the CCTV footage below shows, the powerful surge from Carnival Vista’s engines overwhelmed the marina’s outer wall, buckling a pontoon and crushing several day boats. The incident took place in the Italian port of Messina last month (August 28), and although the manoeuvre caused widespread destruction to the moored vessels, no injuries were reported. Numerous vessels capsized, according to local news provider Ansa, and the video clearly shows one boat being crushed by a collapsing wall, leaving it on the verge of sinking. 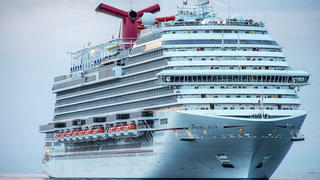 The cruise ship in question is Carnival Vista, which has been serving as the flagship of the Carnival Cruises fleet since her launch in April 2016. Measuring 323 metres LOA, she is even larger than the world’s largest superyachts. It is understood that Carnival Vista was carrying out routine manoeuvres too close to the marina wall. The 15-deck vessel can carry more than 3,900 passengers and displaces 133,500 tonnes. Key features on-board this Cuban-inspired cruise ship include a Havana bar, water park, outdoor cycling track and an IMAX cinema. An investigation into the incident, led by the harbourmaster of Messina, is ongoing. The incident is the latest in a serious of yachting disasters to take place in 2016 so far, including severe marina fires in New York, Abu Dhabi and Marmaris.